The earliest seafloor hydrothermal vents - supposedly more than three billion years old - may be nothing more than deposits from underground springs active in the last few thousand years. That is the claim of two US geologists who carried out a new analysis of rocks from South Africa which were previously dated to the Archaean period - when life first began to diversify. The findings could have important implications for our understanding of the early Earth and the microbial life forms that lived there. But one authority on the geology of the Barberton greenstone belt - where the rocks are found - launched a vigorous defence of evidence that they contain ancient hydrothermal vents. 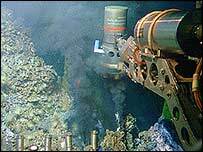 Seafloor hydrothermal vents emit jets of mineral-rich water that has been superheated to up to 400 Celsius by submarine volcanoes. They drive an extraordinary ecosystem in which bacteria process the water to support a range of deep-water creatures that live in total darkness. Many scientists believe the vents could explain how life first got a foothold on Earth and may even provide an opening for life on other planets which appear on the surface to be uninhabitable. 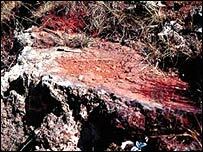 Large lumps of iron oxide in the ground at Barberton called "ironstone pods" were thought to be have been formed by ancient hydrothermal vents. Analysis suggested the pods formed when vents spewed out iron-rich water into surrounding seafloor sediments 3.5-3.2 billion years ago. They yielded what could be the oldest-known complex organic chemicals, suggesting the ancient vents were home to colonies of microbes. But the new research proposes these pods formed when underground springs or groundwater dissolved iron from existing Archaean rocks and deposited it as bodies of iron oxide. The new study estimates this process took place at the Earth's surface within the last 100,000 years. Consequently, the pods "contain no record of Archaean life or environments". The report claims the pods are mostly composed of the iron oxide goethite, which is unstable above temperatures of 80-100 Celsius. "If the pods were part of Earth's original continental material, they would have been exposed to temperatures exceeding 300 [Celsius]," said Professor Gary Byerly of Louisiana State University, US, one of the report's authors. This suggests goethite was deposited at relatively low temperatures. The US team has also found tiny structures in the pods resembling stalactites and stalagmites. These hang vertically, suggesting the pods have not been deformed over time like surrounding rocks. But Dr Cornel de Ronde of New Zealand's Institute of Geological and Nuclear Sciences said some rocks described by the US team were miles away from the pods he studied, and probably have a distinct geology. 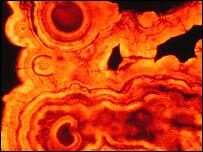 He suggested "classic" ironstone pods were largely composed of haematite, with a weathered goethite layer. "Haematite forms at 220-260 Celsius. This stuff can't form at low temperatures - it's impossible," he said. Veins of quartz snaking through the pods are Archaean in age, say the US team, but they are relics of ancient rock replaced elsewhere by ironstone. But Dr de Ronde claims these are closely associated with the structure of ancient vents. "We see delicate networks of quartz veins all contained in the centre of what look like chimneys," said Dr de Ronde. Chimneys are tall structures atop some vents, formed when dissolved minerals precipitate out of vent water. Seafloor vents may have played host to the earliest life forms and some researchers think they dominated many processes in the early oceans. But Professor Donald Lowe of Stanford University, California, and co-author of the new research, thinks early oceans behaved much like modern ones. "This is one chink in the armour of models depicting the early Earth as one big hydrothermal system," Professor Lowe told BBC News Online. "Essentially, the message is one of caution - because you may be seeing something young in among the old rocks," said Professor Euan Nisbet of the Royal Holloway, University of London in Egham, UK. "The evidence is subtle and the paper will be controversial," he added. The research is published in the journal Geology. Dr de Ronde plans to submit a formal comment - or reply - to the journal before Christmas.